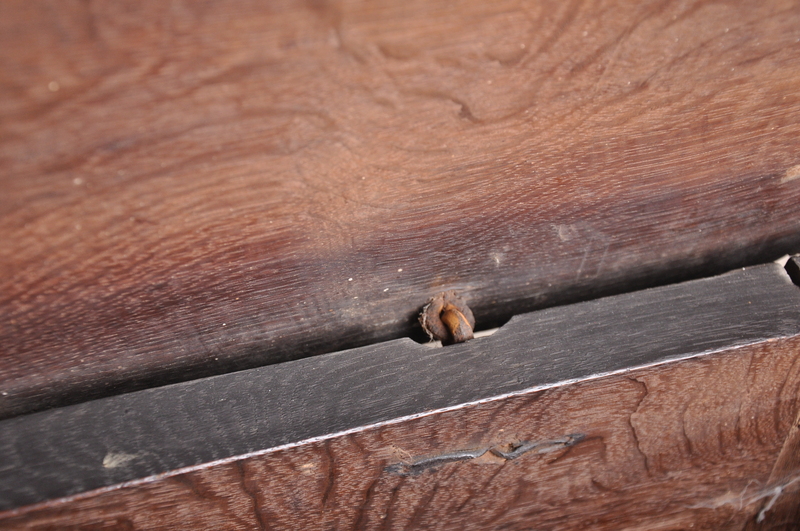 highly figured original veneers throughout with only miner repairs. 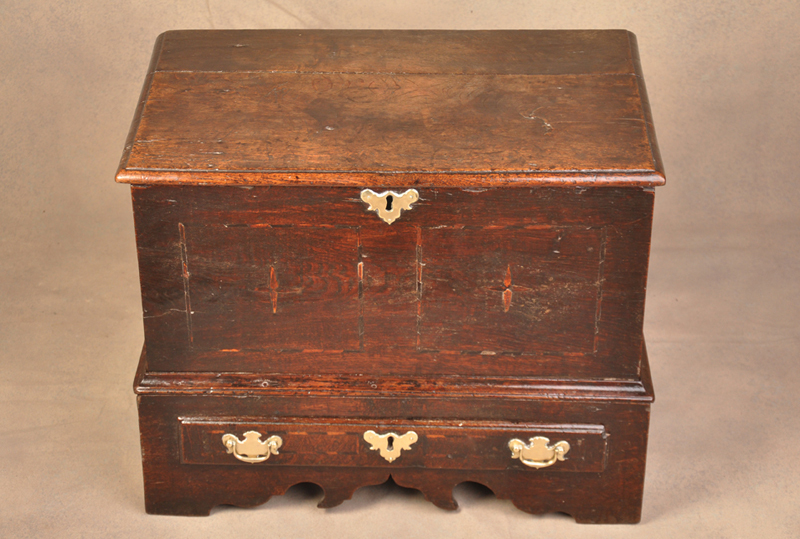 The Chest has extremely clean Oak drawer linings with original locks and original running strips. The feet are mostly original with a few repairs, the back boards are also original. 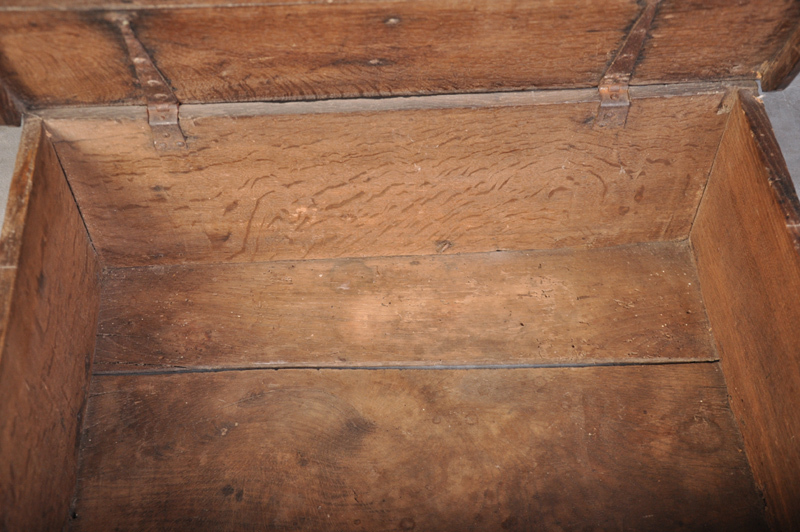 The feather banding is particularly fine, another most unusual feature is the edition of a fine box wood bead applied to the base mould and front feet. 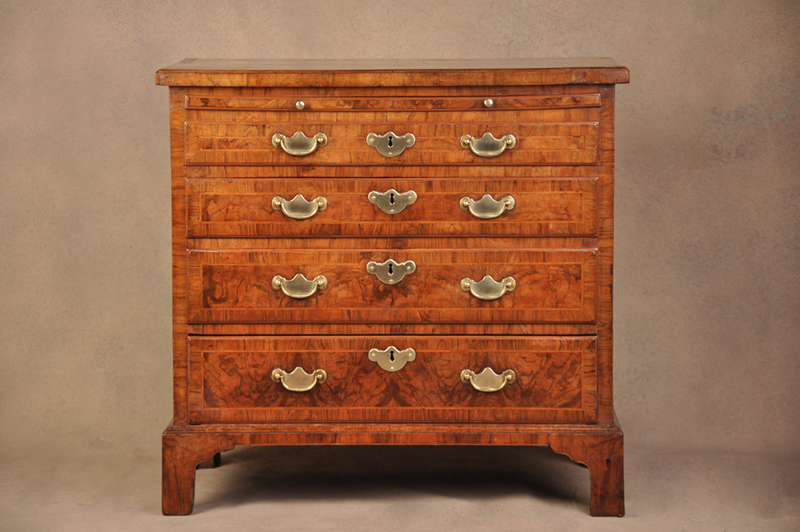 A fine and rare early 18th Century Walnut Bureau Cabinet in figured walnut having superb colour and patina with original glass plates. 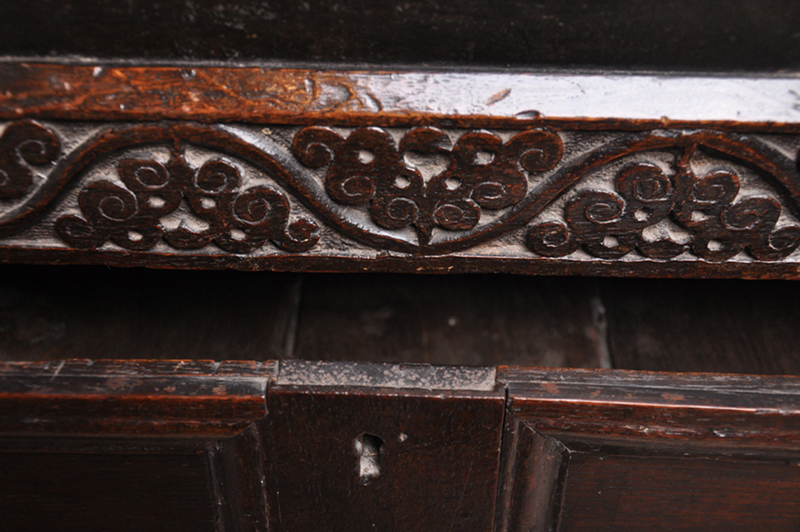 The drawer linings are in oak, they are wonderfully clean and completely original. 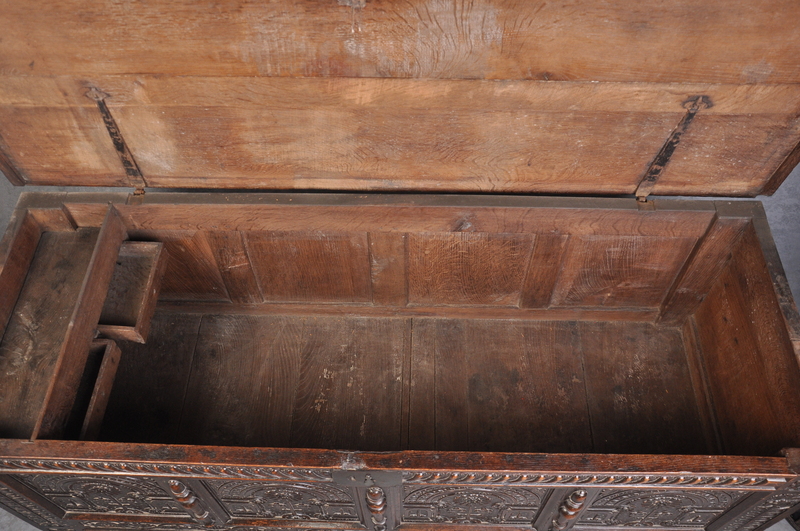 The cabinet interior is fitted with the most amazing arrangement of drawers with a shaped door to the centre. 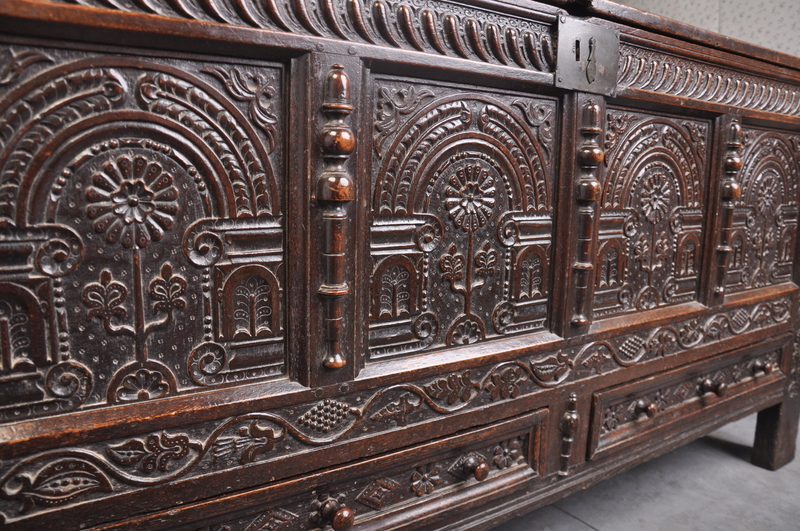 The bookcase has been made in three sections which is consistent with many of the finest quality examples of the period. 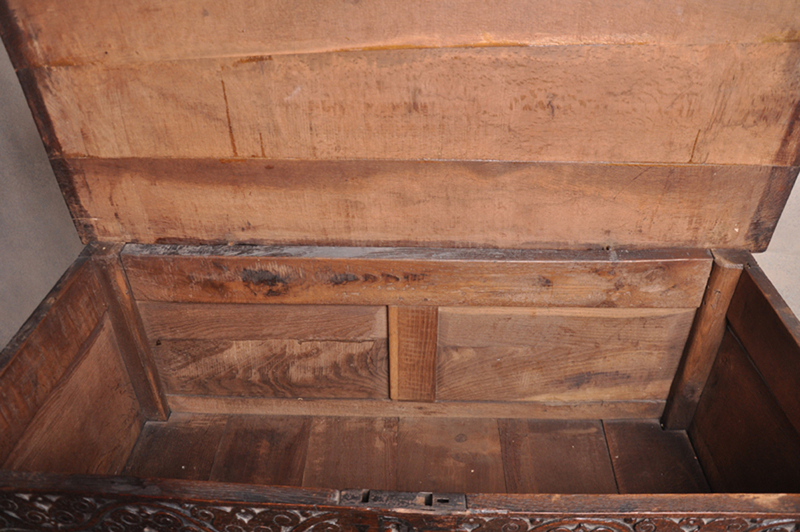 The interior of the middle section contains some nicely made secret drawers. 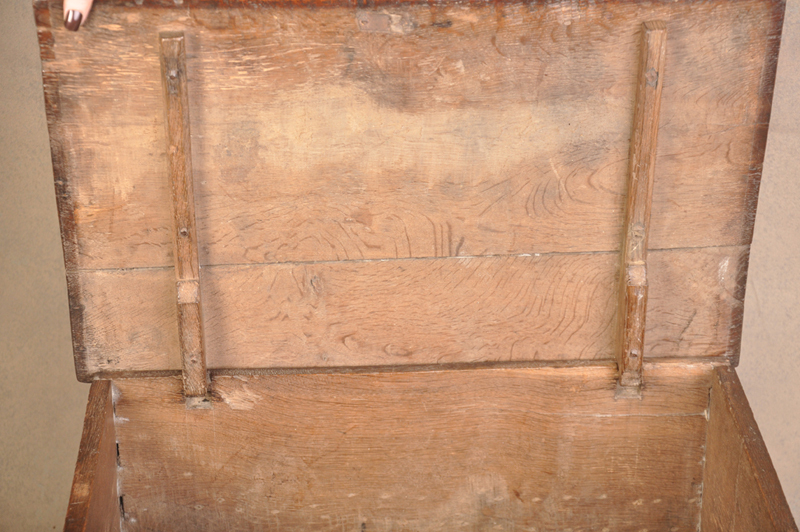 The back boards are all original. We have not seen an interior quite like this before, it was probably specially commissioned for a wealthy customer who was possibly Lord of the Manner at Nowton. 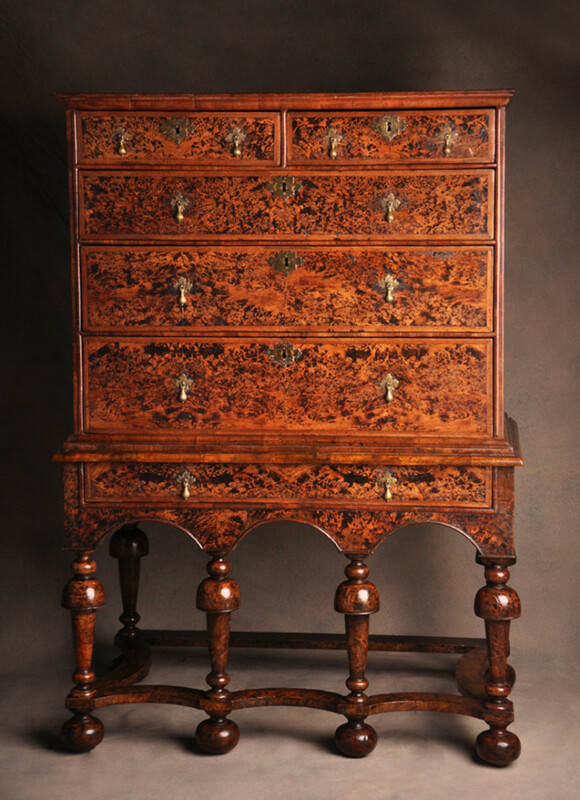 The quality of the craftsmanship and unique interior along with the selection of superbly figured veneers suggest that this piece was an important commission. 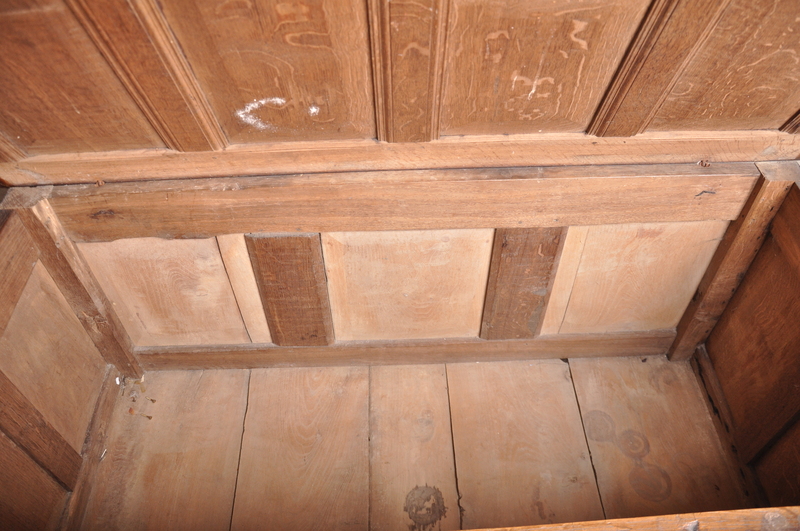 This bookcase was owned by the Oakes Family of Nowton Court. The cheque book of Mrs Oakes is inside the bookcase along with quite remarkably the original architects drawing of Nowton court on linen with the name J H Porteus Oakes and a later updated drawing with the name James Oakes. The address on the book was Breckey Ley (formerly called Brakeley House) It forms part of the wider Nowton Estate. This was in the ownership of the Oakes family for over 150 years. Breckey Ley was built around 1880 as the dower house for Nowton Court and occupied by the family ever since. Henry James Oakes (born 1796 in Bury St Edmunds, Suffolk; died 1875 in Nowton, Suffolk) was an English first-class cricketer. He is recorded as a batsman for Cambridge University in one match in 1819, totalling 6 runs with a highest score of 5 not out. Oakes’ family lived at Nowton Court, Nowton, Suffolk, near Bury St Edmunds. He was educated at Reading School, Bury St Edmunds Grammar School and Emmanuel College, Cambridge. He inherited Nowton Court in 1837 and became lord of the manorof Nowton. He was head of his family’s bank, Oakes, Bevan & Co. (later Oakes, Bevan, Tollemache & Co., taken over in 1900 by Capital and Counties Bank, which was acquired by Lloyds Bank in 1918). He was mayor of Bury St Edmunds in 1844 and High Sheriff of Suffolk in 1847. 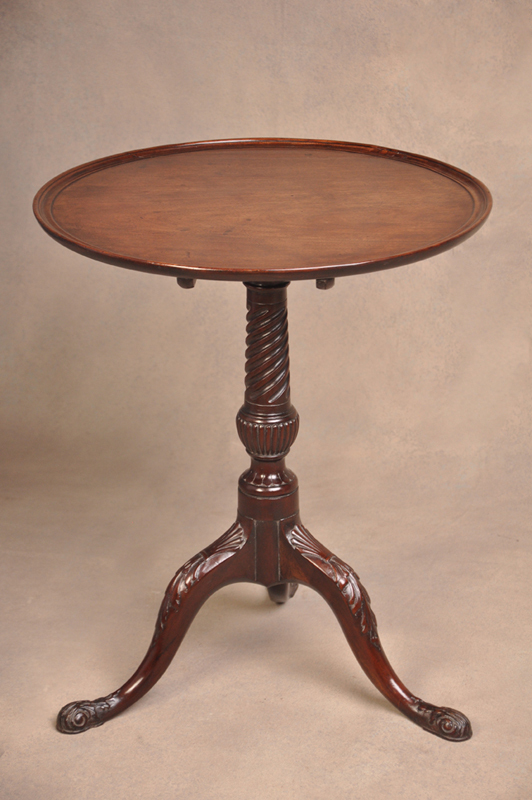 A fine example of an 18th Century Mahogany Tripod Table in very good original condition with nicely figured one piece top. 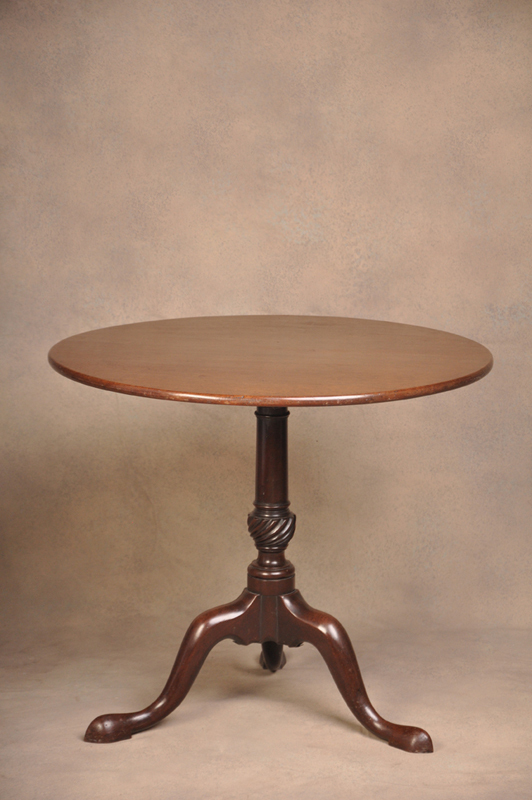 A good quality 18th Century Mahogany Tripod Table of good solid proportions with well shaped base and stem made from finest quality Cuban Mahogany. The table is in good original order. 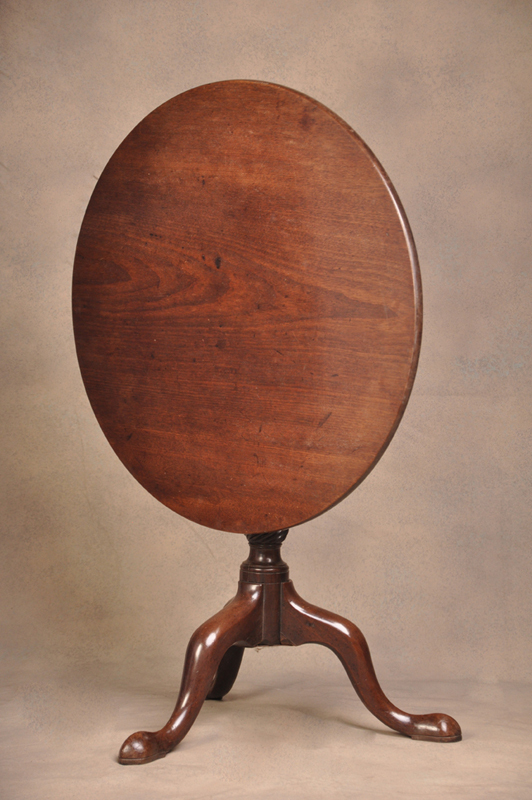 A wonderful little Mahogany tripod table from the Chippendale period with tray top. 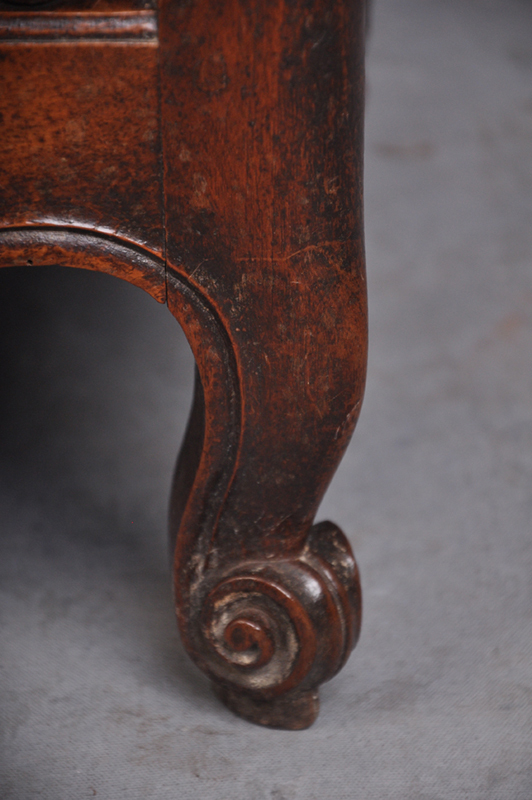 The stem having a carved twist above a reeded and petal base. 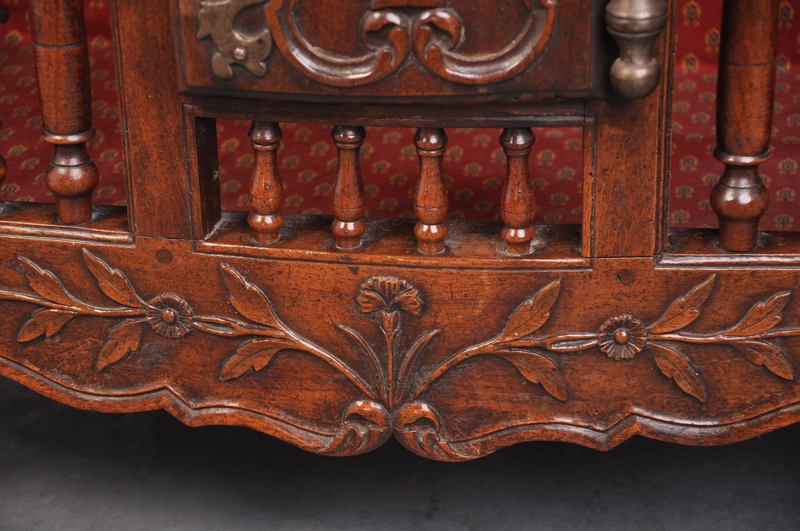 The legs carved with shell and acanthus leaf terminating in a scroll and foliage foot. 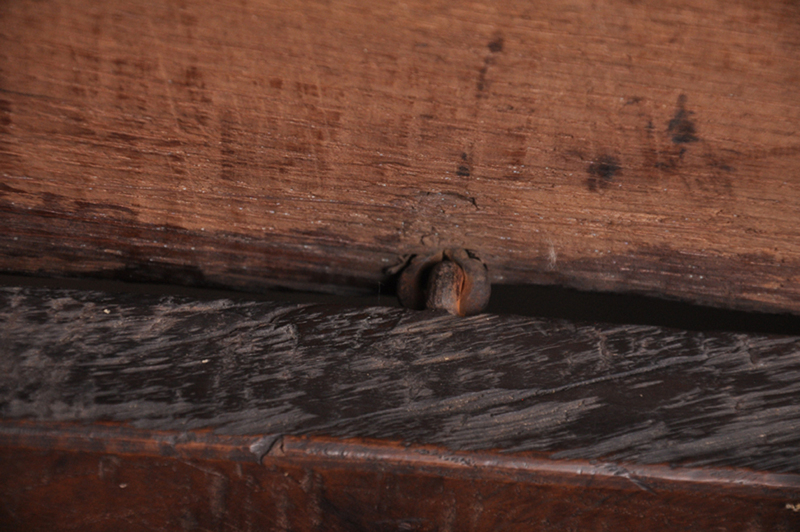 There are some very small repairs to the tray top and the tops of the feet that are not noticeable. The table is a rich warm colour. 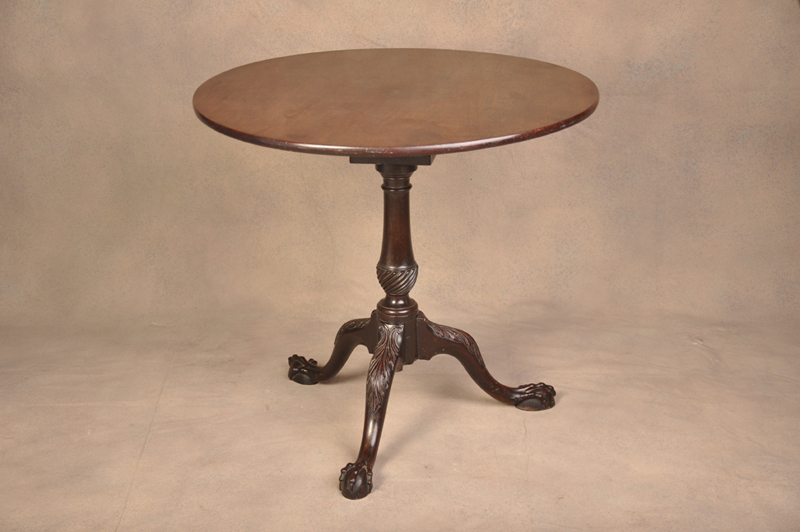 A fine Chippendale period Mahogany Tripod Table of very good colour with bird cage action. 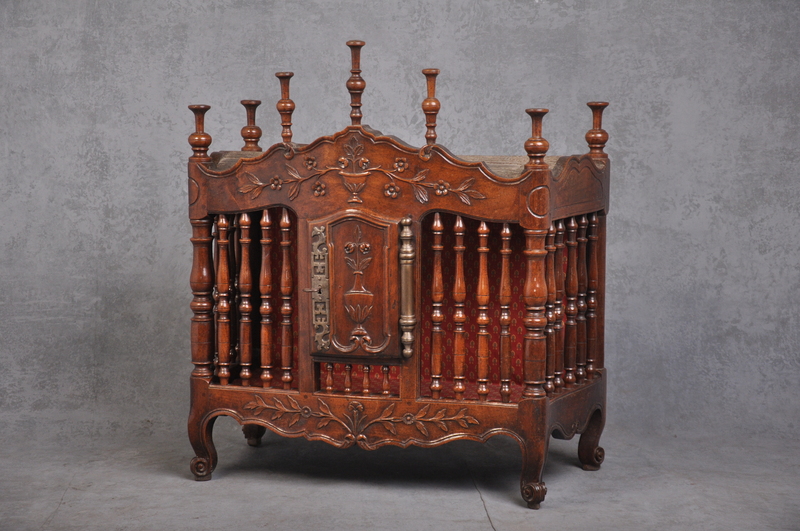 Made from the very best cuban Mahogany and in outstanding original condition. 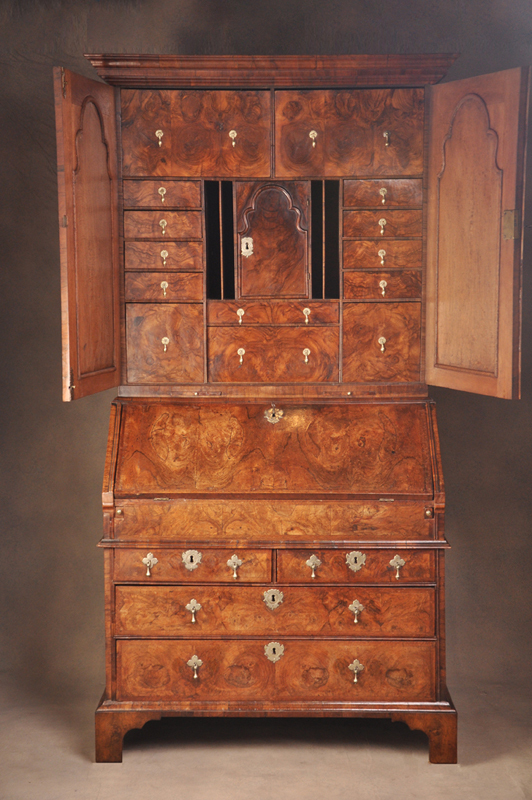 It is a masterpiece in design and execution from the pinnacle of the English furniture making period. 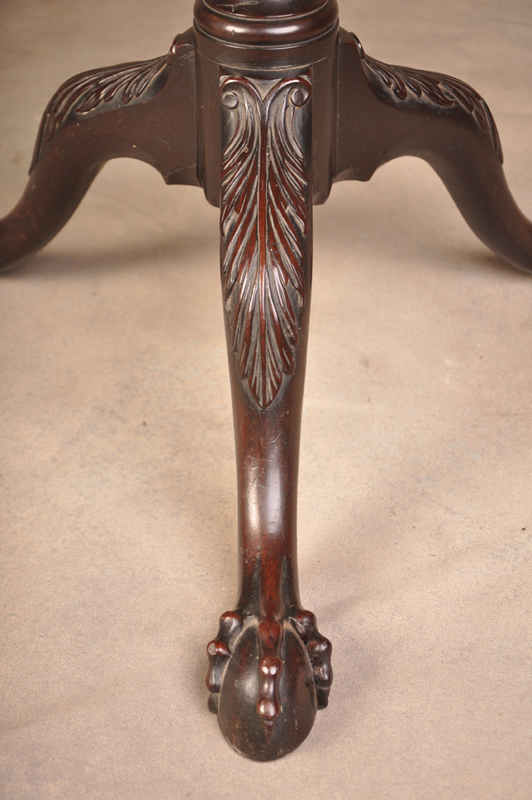 The stem carved with a twist and the legs expertly carved with acanthus leaf and claw and ball foot. 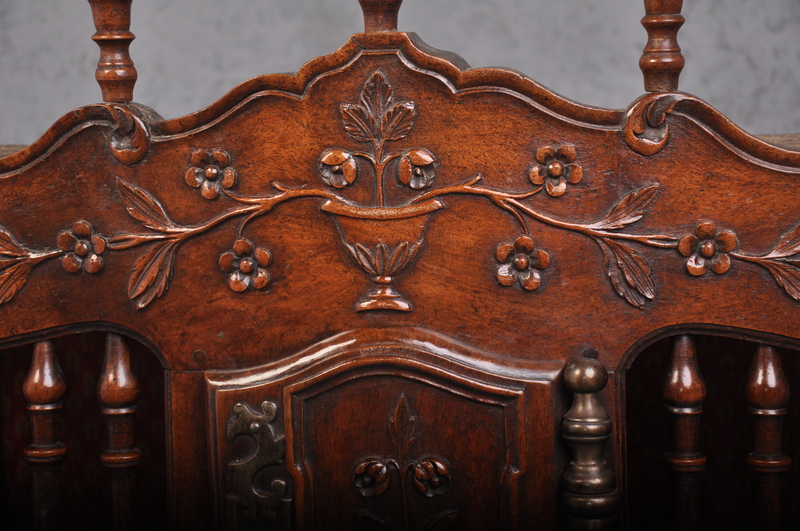 A Charles II Oak Armchair with Scroll carved back and stretcher of excellent rich colour. 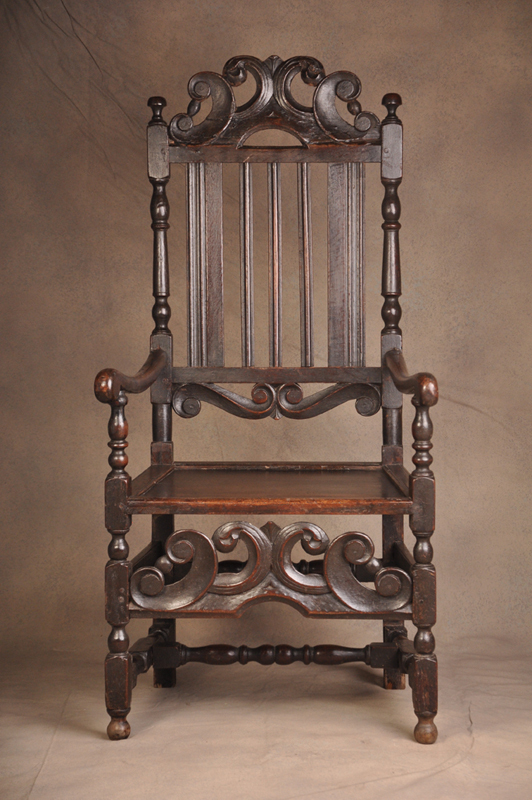 This is an honest chair with minor patches, the feet are tipped with about two inches added to each foot. 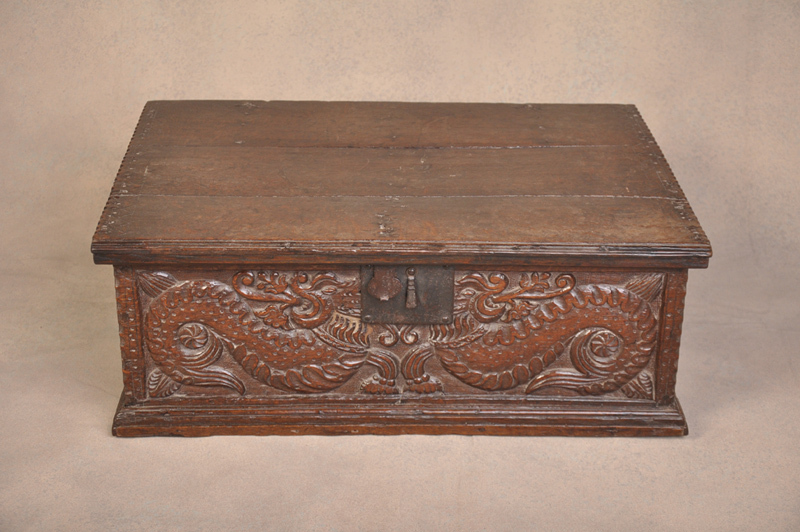 A rare and impressive late 17th Century Mulberry Chest On Stand in the manner of Coxed & Woster having very good colour and patina in burr Oak and Walnut with quarter veneered and feather banded top in Walnut. 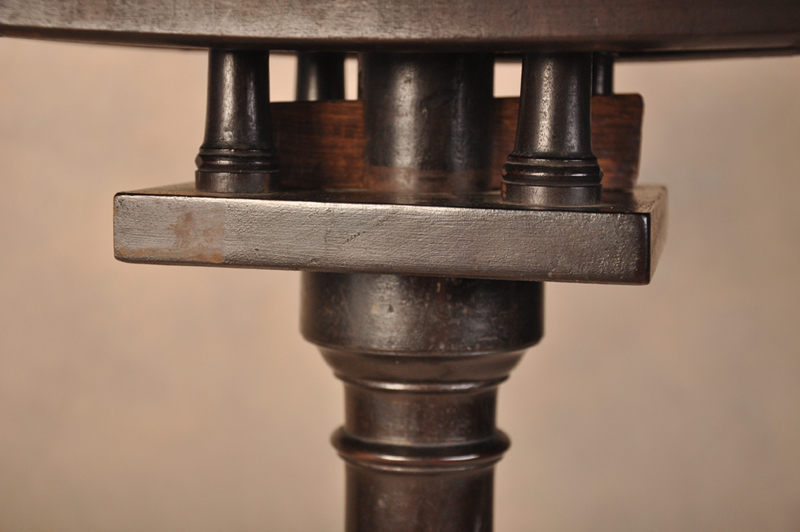 The later stand matches the top perfectly, the same timbers have been used and the design is correct for the period in every aspect. 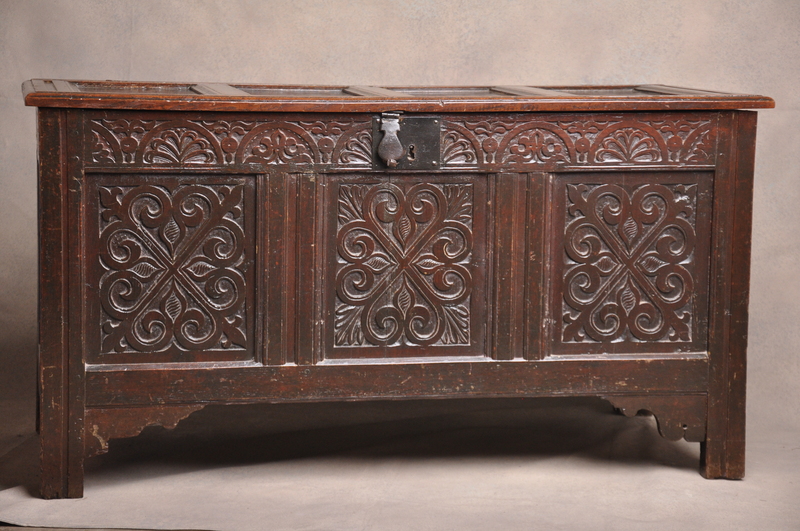 Much has been written about the firm Coxed & Woster who made quite a lot of Mulberry Furniture from around 1690 to 1720. 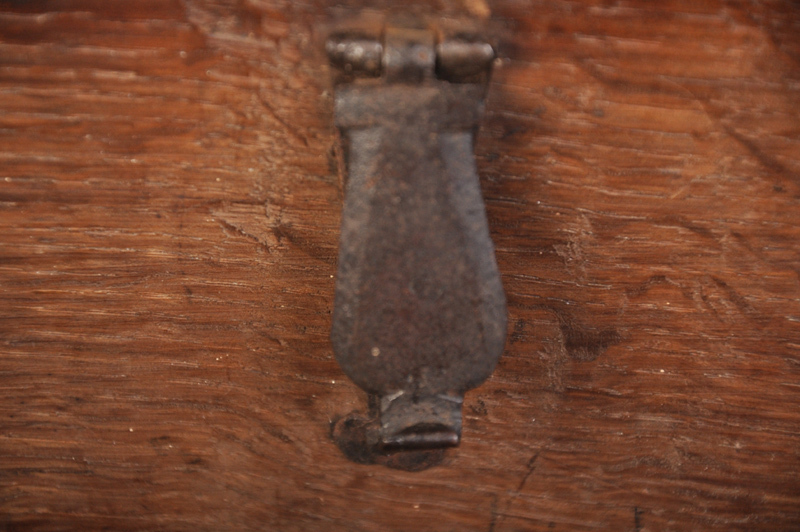 There were obviously other makers of Mulberry although very little has survived in anything like good condition. 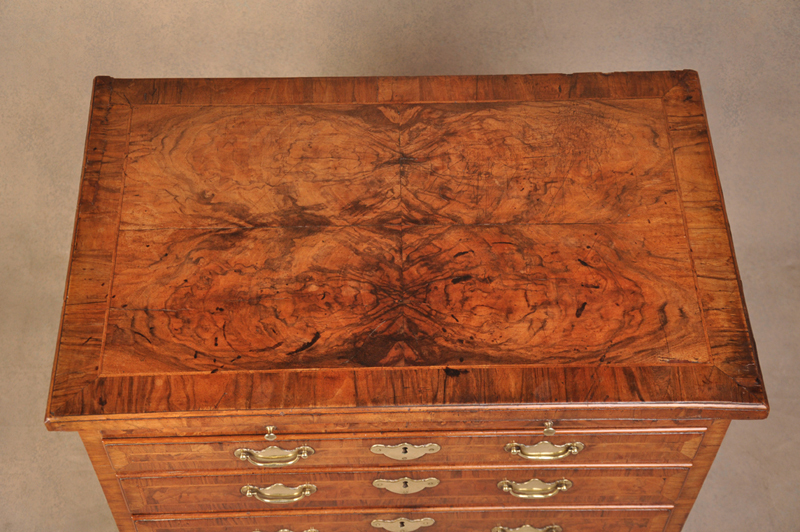 In the past pieces have been described as Mulberry when in fact they are just burr veneers of one wood or another. This piece is a true Mulberry in every sense of the word. 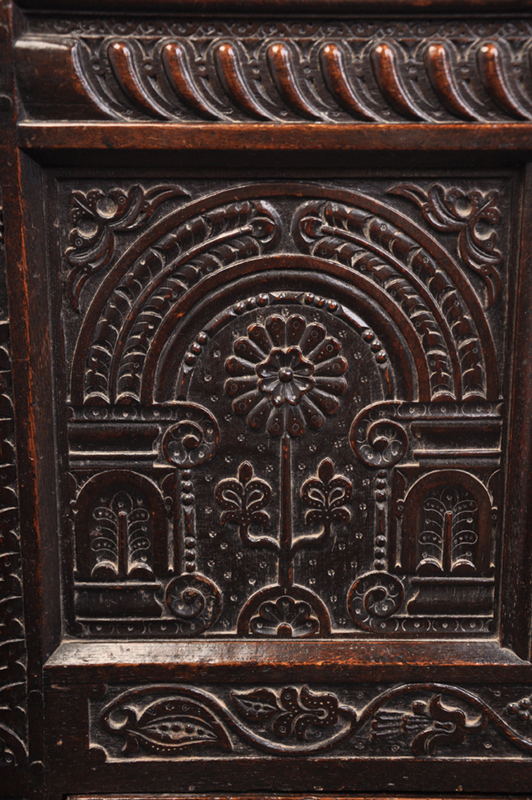 A piece with similar veneers was sold at Christies on the 8th of July 1999 , Lot 97. 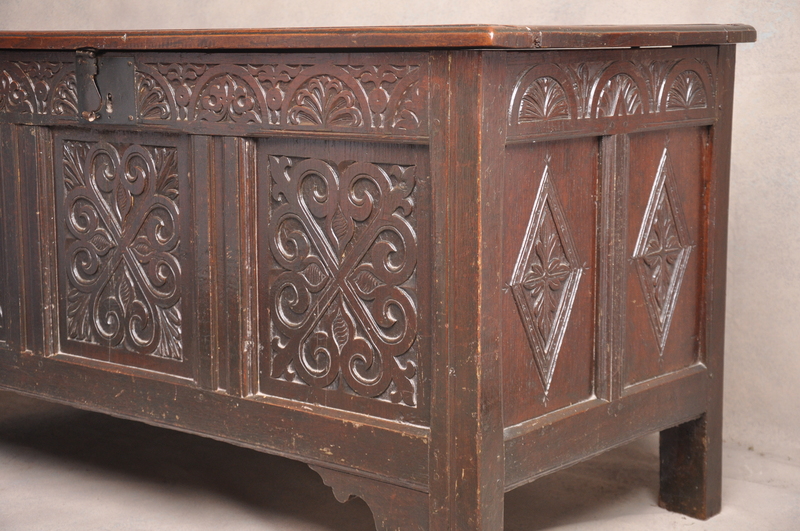 A wonderful early 18th Century Welsh Oak Coffer Bach of outstanding deep rich Colour and patina with inlaid stars and half chevron banding to the front. 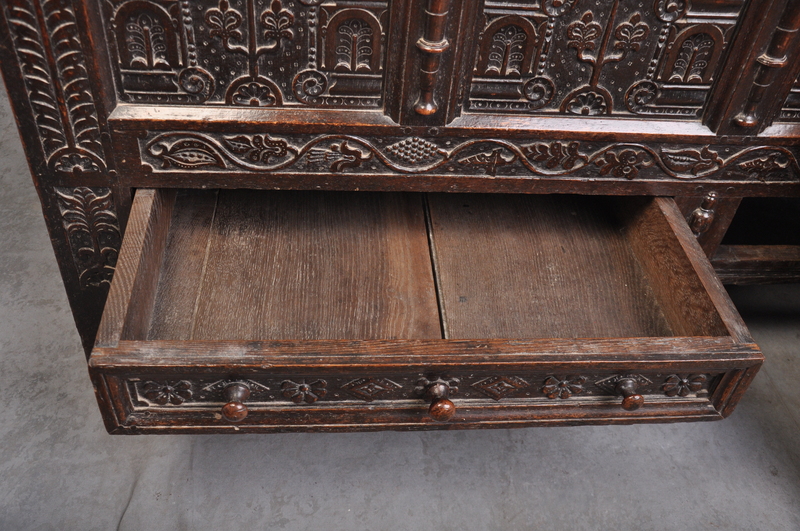 The lid is removable as is normal on this model of Coffer and the inside is nice and clean just as we like to see. 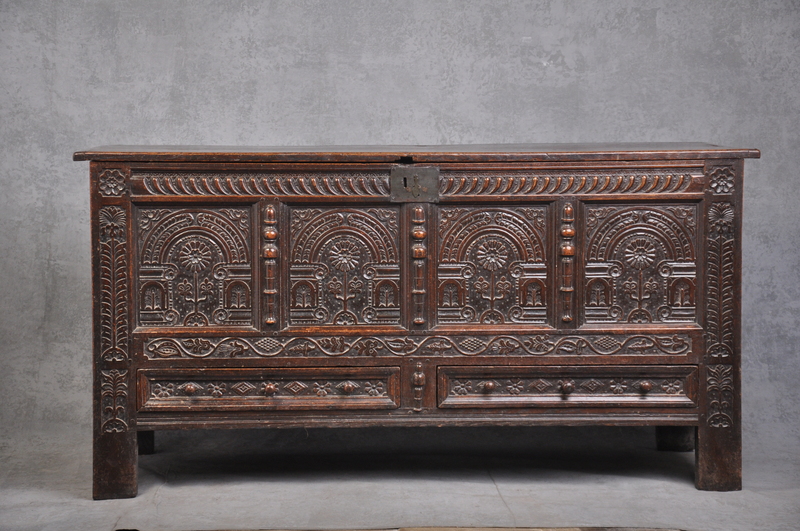 A very good 17th century carved Oak Coffer from the north of England having good colour and patina with its original hinges. 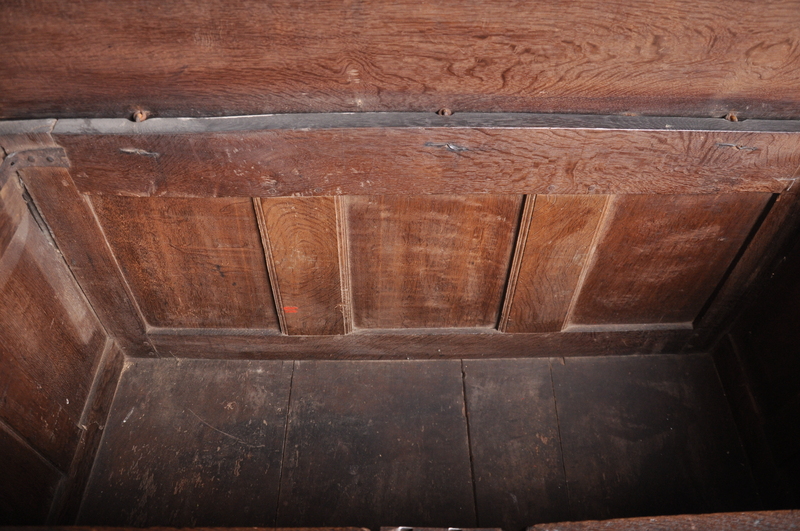 The inside is exceptionally clean with Elm panels to the back sides and bottom. A fine example in lovely original condition. 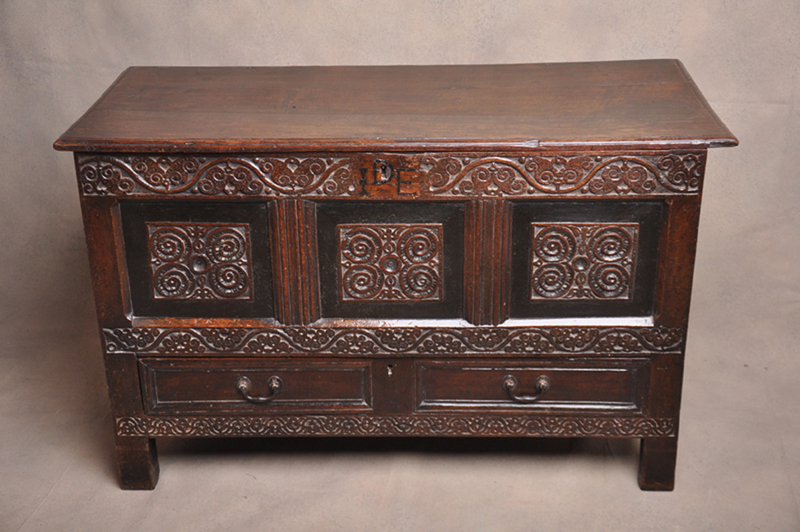 A very attractive 17th century Oak Mule Kist from the Trough Of Bowland with original ebonised borders around the scroll carved panels. 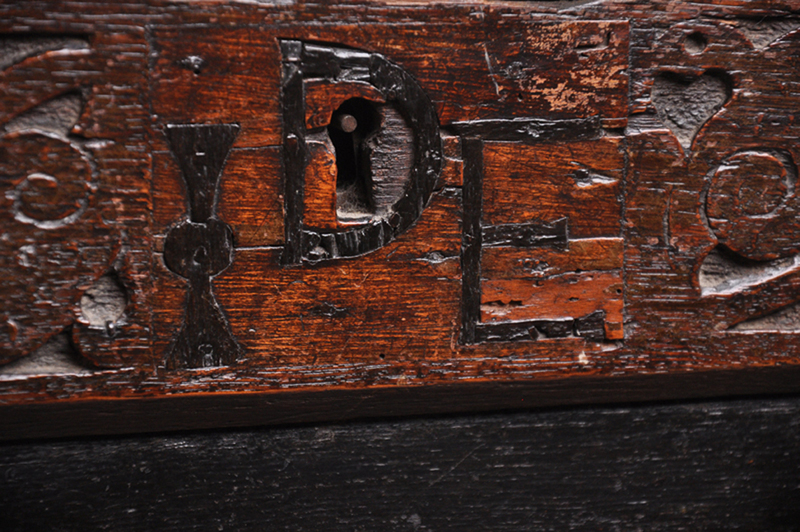 The Coffer has its original hinges and inlaid initials of I D E on the top rail. 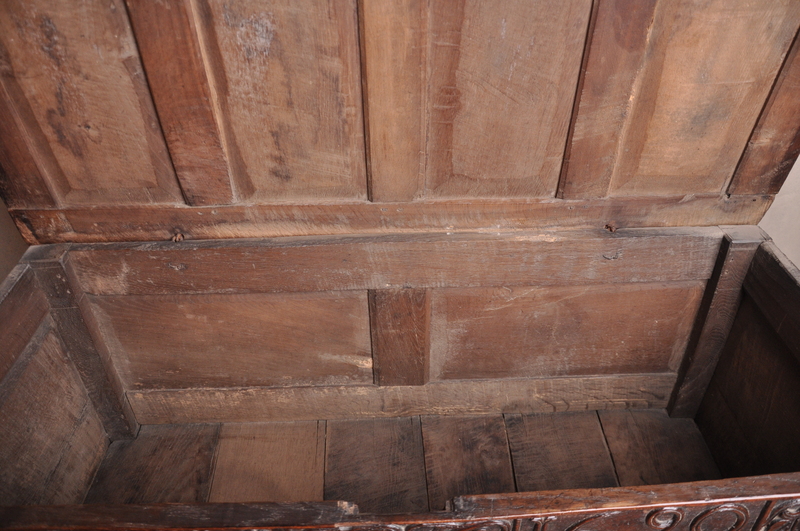 The colour is very good as is the condition ,its very clean and untouched inside. 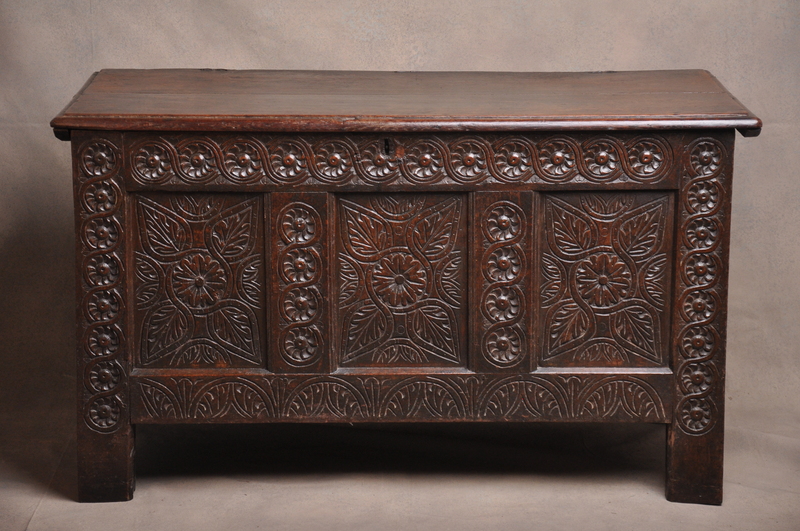 A profusely carved 17th century west country Oak Coffer of wonderful colour and very solid construction with original ring hinges. 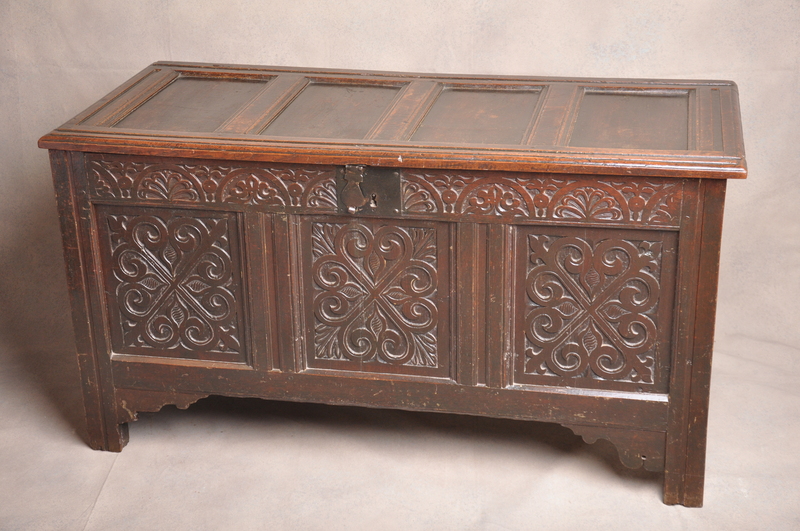 The Coffer is in good original order throughout. 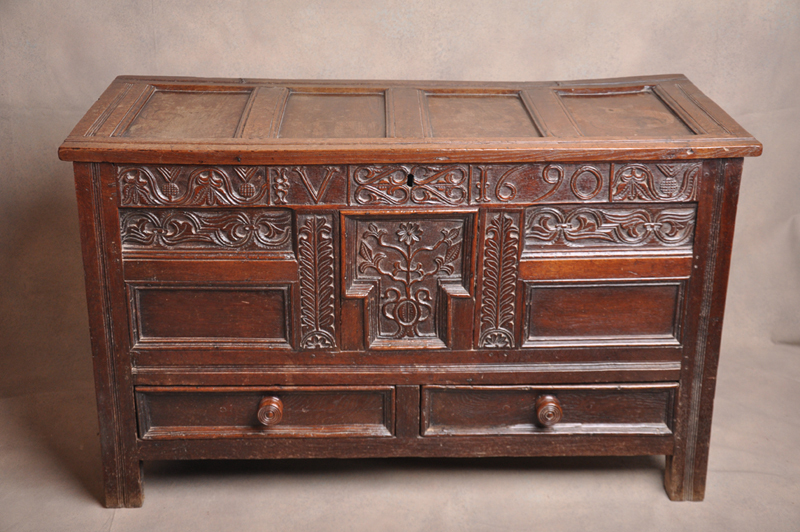 A rare 17th century Oak Mule Kist with paneled top and unusual construction featuring a series of small panels. 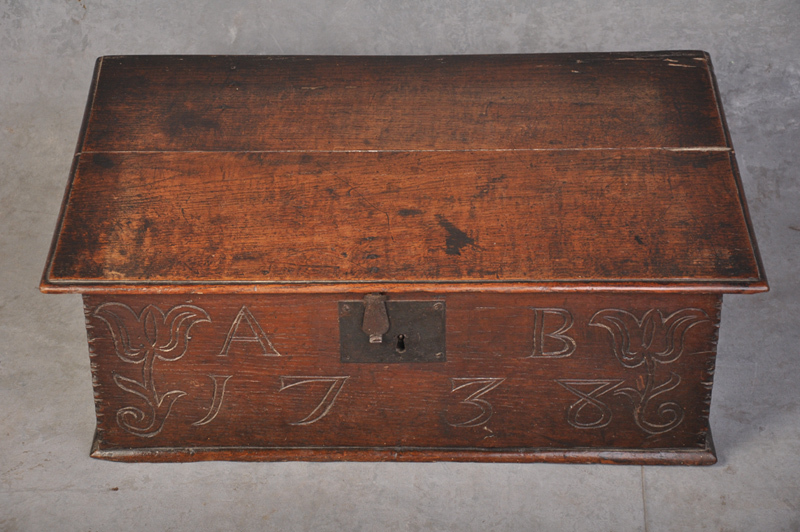 Dated 1690 and initialled I V. The colour and condition of the Coffer is superb with original ring hinges. 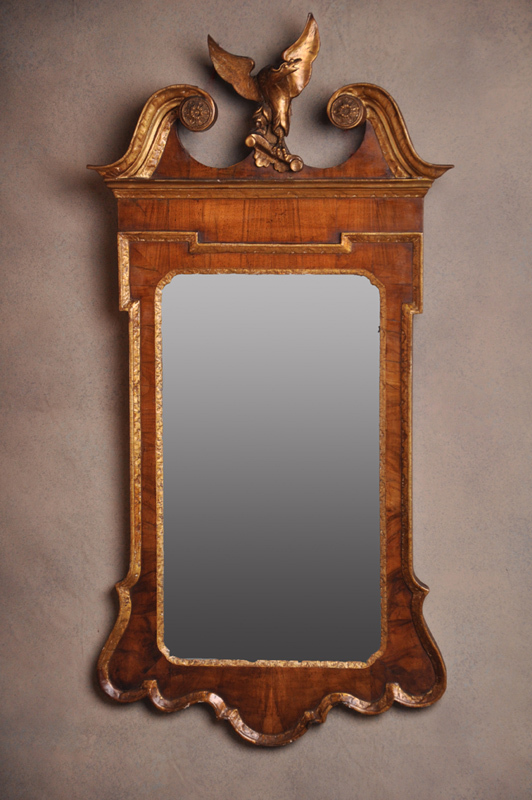 An Impressive George II Walnut and parcel gilt mirror of good colour retaining the original glass plate. The swan neck pediment centered with a carved Ho Ho bird. 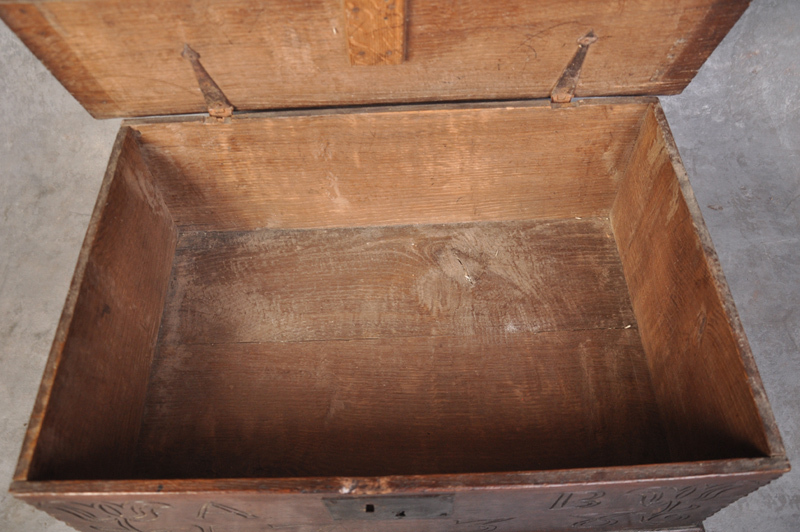 18th Century Oak box of lovely colour in very good original condition with nice original metal work. 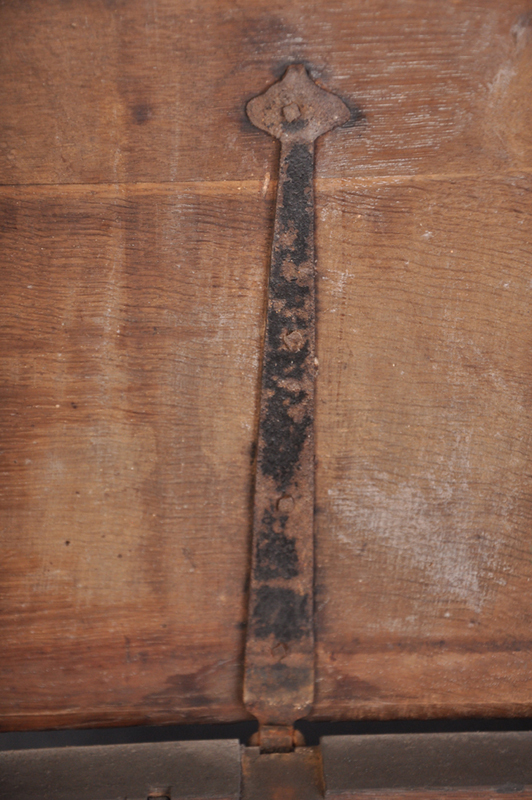 Initialled A B and dated 1738. 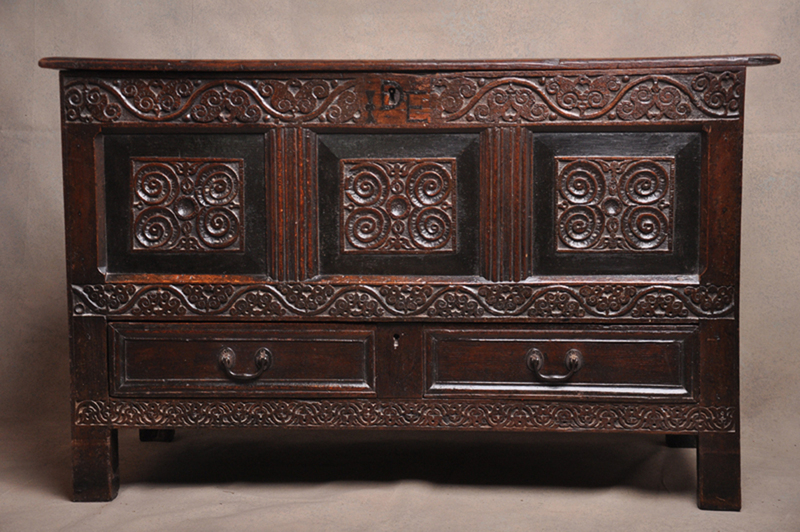 This is a rare and outstanding mid 17th Century carved Oak Box. 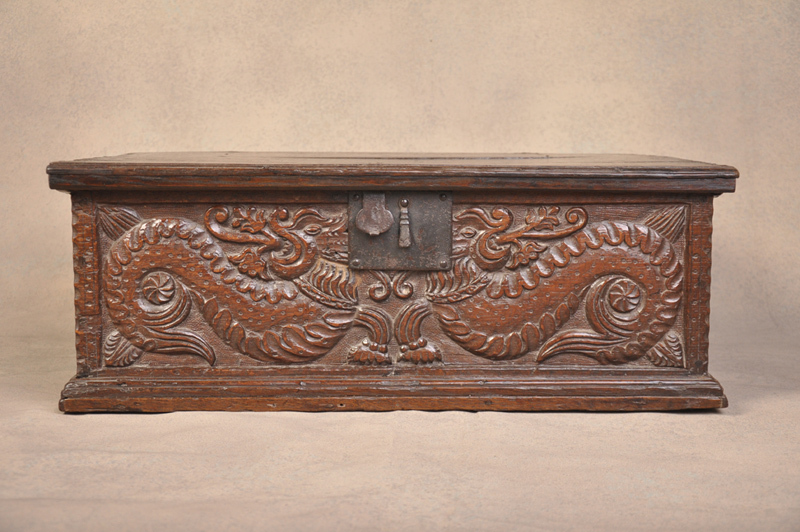 The Superbly carved front depicts a pair of Sea-Wyverns . 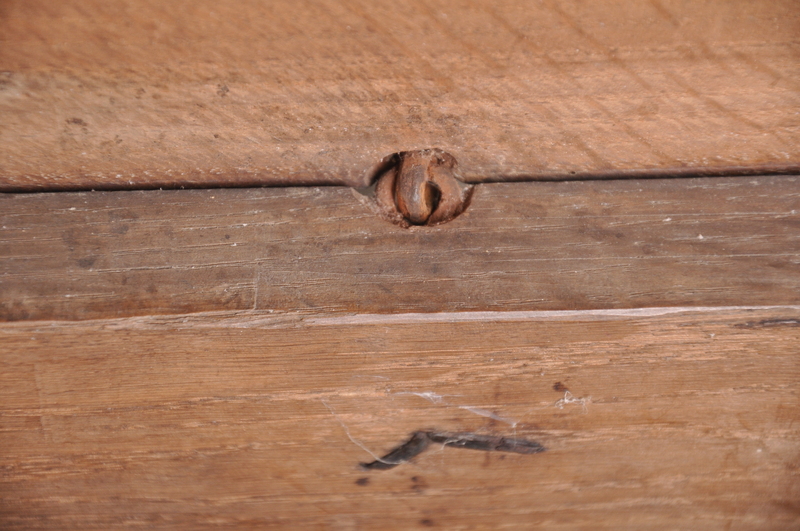 The box is in good original order, retaining for the most part its original hinges. It has a very good rich warm colour and patina. A wyvern (/’wa?v?rn/ WY-v?rn, sometimes spelled wivern) is a legendary creature with a dragon’s head and wings, a reptilian body, two legs, and a tail often ending in a diamond- or arrow-shaped tip. A sea-dwelling variant dubbed the sea-wyvern has a fish tail in place of a barbed dragon’s tail. The wyvern in its various forms is important to heraldry, frequently appearing as a mascot of schools and athletic teams (chiefly in the United States, United Kingdom, and Canada). It is a popular creature in European and British literature, video games, and modern fantasy. 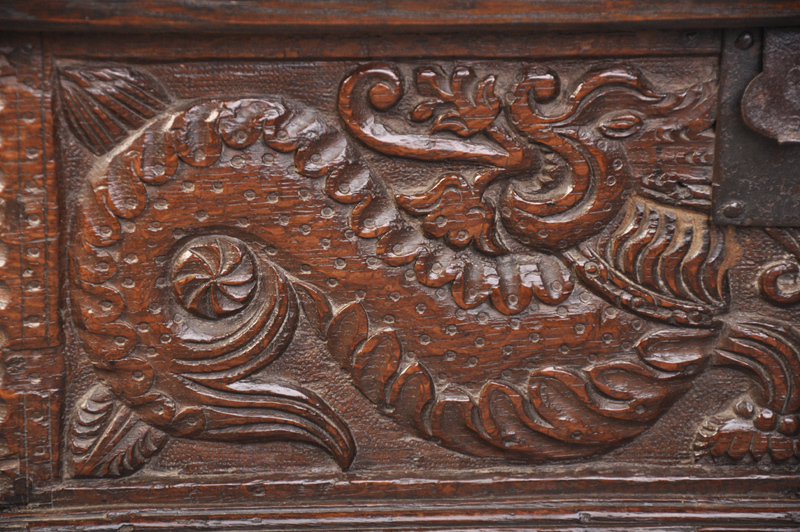 The wyvern in heraldry and folklore is rarely fire-breathing like the four-legged dragon. Sometimes modern fantasy book and media authors have wyverns that are frost-breathing or poison-breathing instead of fire-breathing. 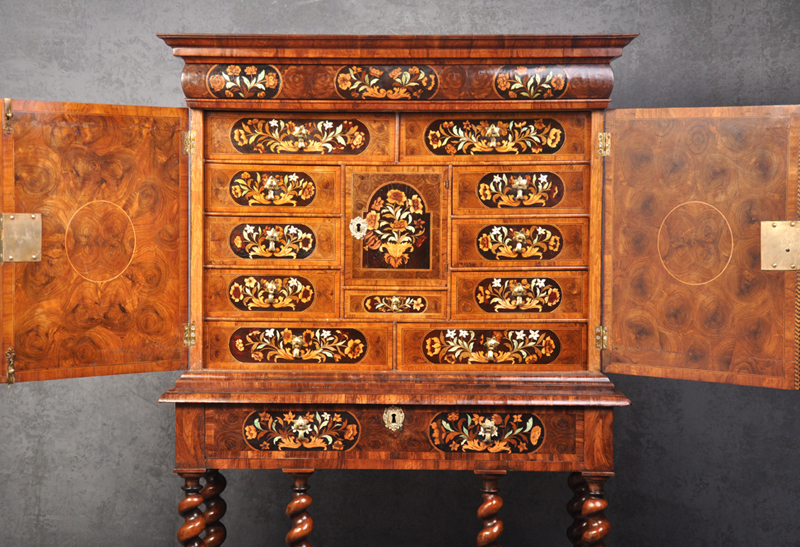 Charles II Olive Oyster-Veneered And Floral Marquetry Cabinet On Stand. 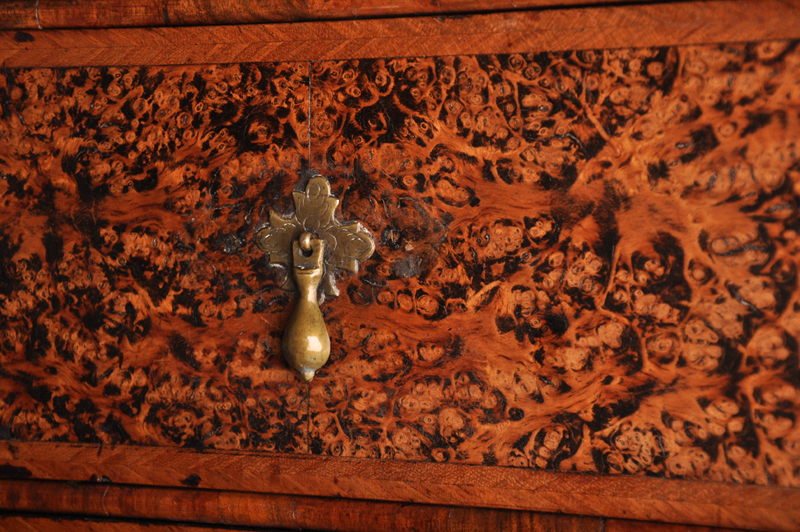 A Rare And Highly Important Charles II Olive Oyster-Veneered And Floral Marquetry Cabinet On Stand. 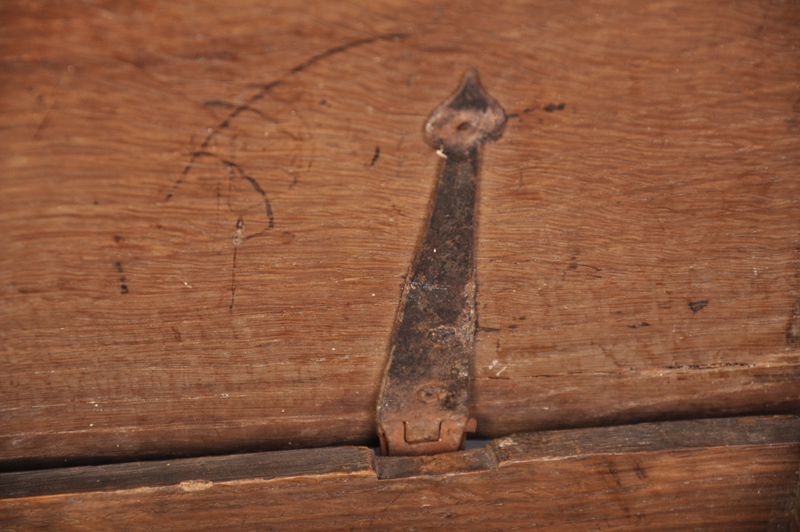 Probably by Gerrit Jensen cabinet-maker to the royal household. 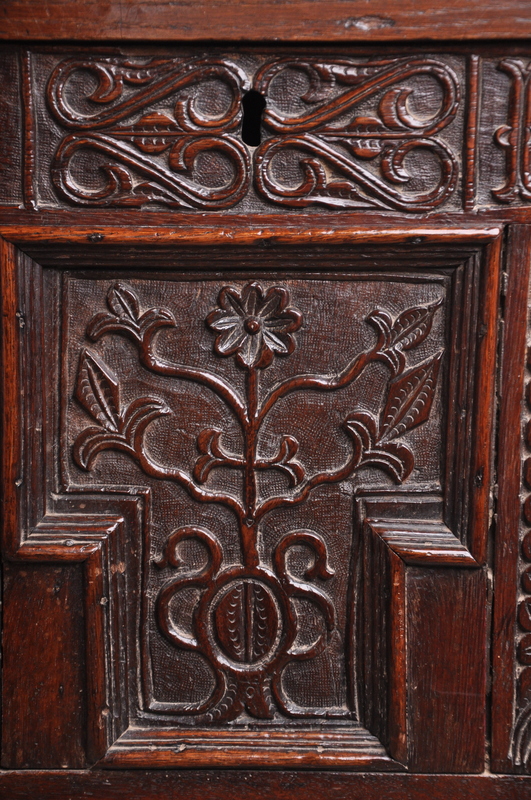 The moulded cornice and cushion drawer with marquetry panels above a pair of doors each centered with an arrangement of flowers and a perching Parrot surrounded by foliate spandrels. 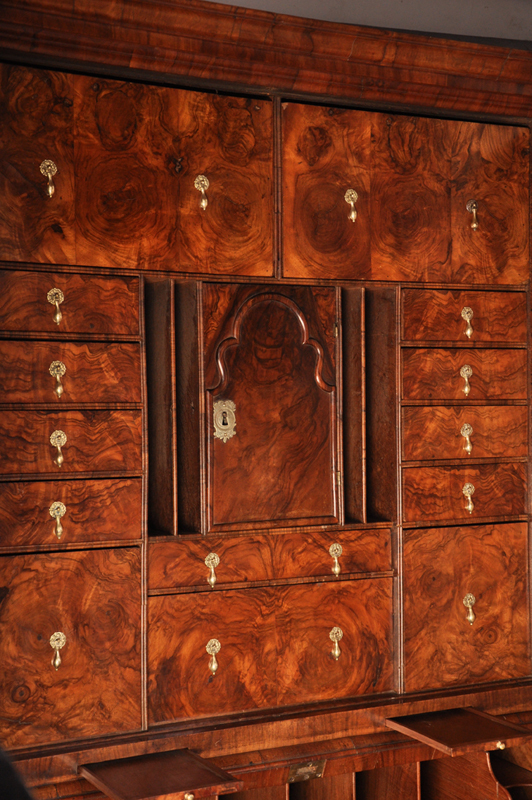 The outstanding interior with eleven marquetry drawers and central door with three further drawers behind all lined in oak and retaining the original gilded fish tail handles. 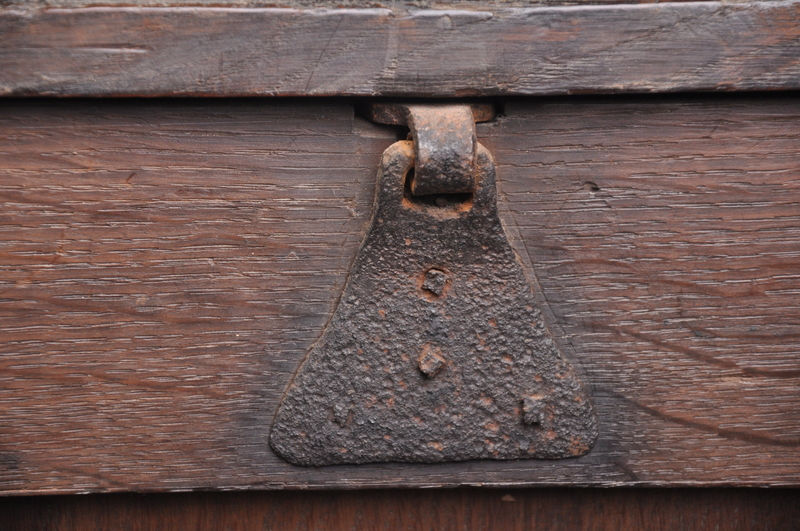 The drawers are clearly numbered we believe by the maker in roman numerals. 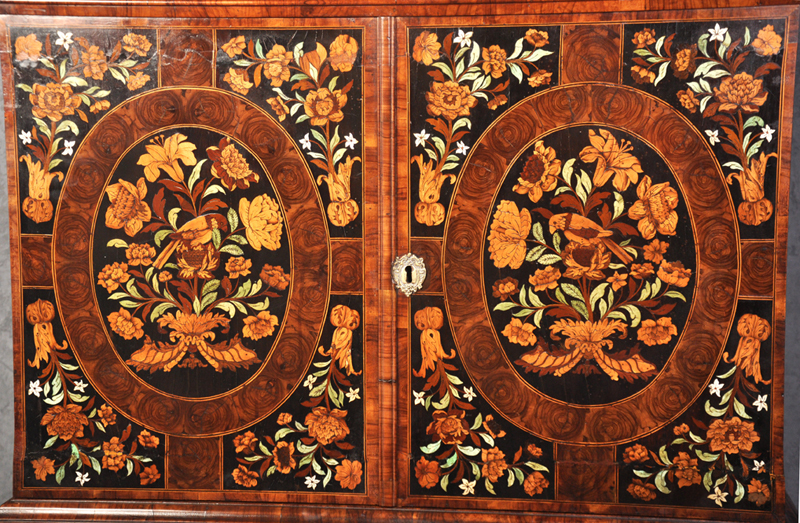 The sides are also decorated in similar marquetry panels. The stand with a long frieze drawer oyster-veneered with marquetry panels on twist turned walnut legs with shaped stretcher and bun feet. 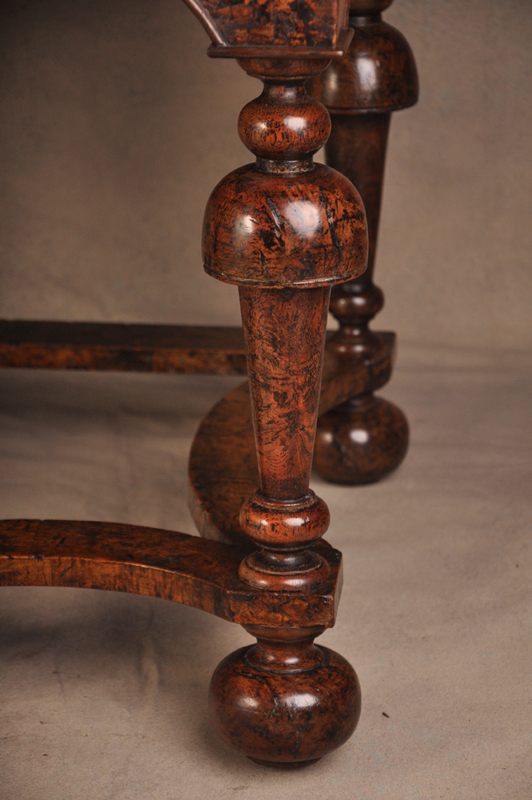 The twist legs and stretcher replaced to match the original design. 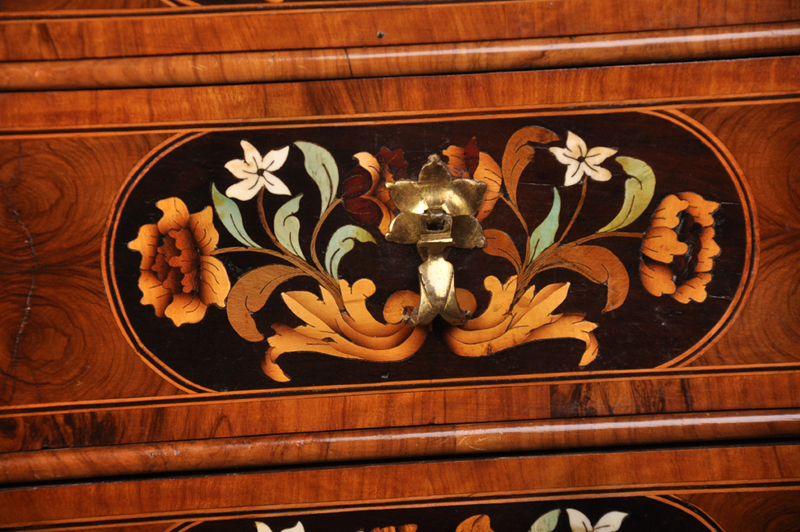 The striking similarities in the detail of the marquetry work and handles on this cabinet and that on the one at Ham House by Gerrit Jenson lead us to believe it is likely they were made by the same maker. Elizabeth Murray of Ham House was the countess of Dysart a former town and borough close to Edinbrough where this cabinet was discovered. The Murray family home was Tullibardine Castle that was dismantled in 1747 and then completely demolished in the 1830s. Elizabeth Murray who was close to Charles II had an eye for the finest furniture and works of art, she significatly extended and refurbished Ham house around 1670-1680. 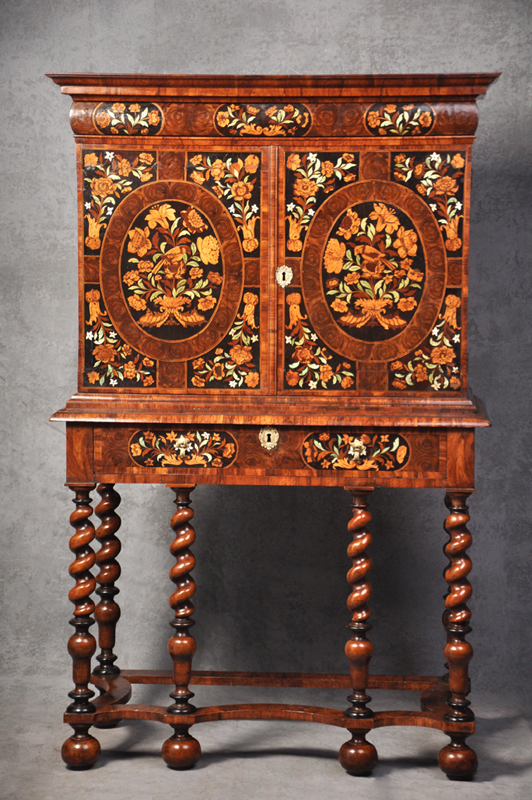 A Cabinet very similar to this one was recently acquired by the National Museum Of Victoria, it was sold previously at Christies in ( The English collector & Tapestries ) London on the 31 of October 2012, Lot 62. 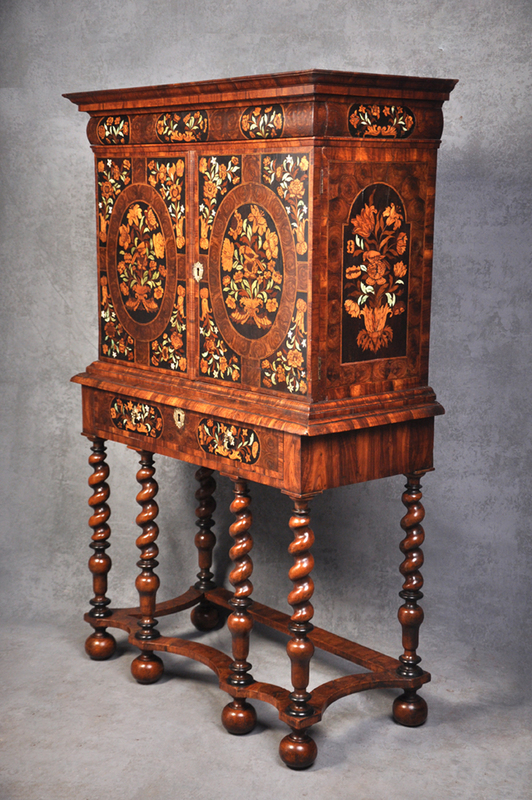 Herbert Cescinsky, English Furniture from Gothic to Sheraton, page 129 & 135. 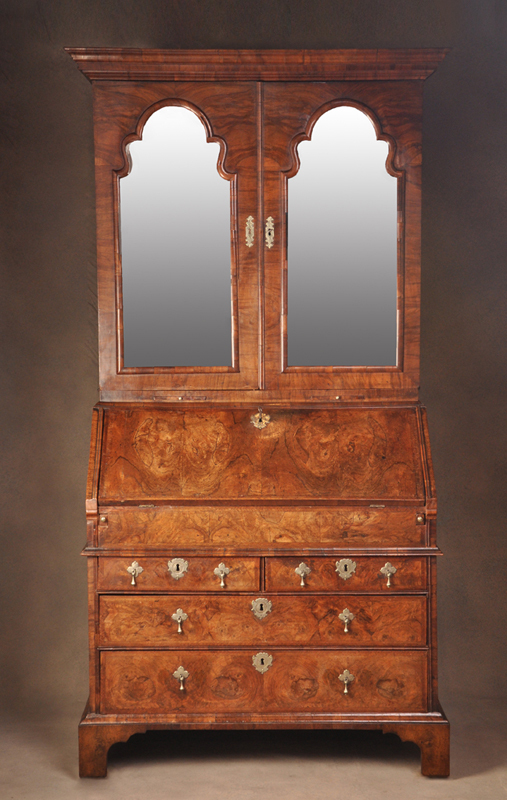 Herbert Cescinsky, English Furniture of the 18th Century, page 96 & 97. 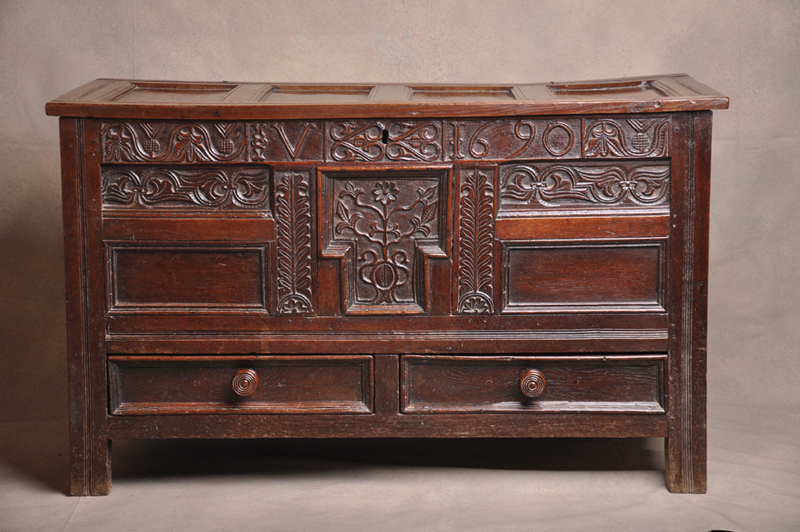 Adam Bowett English Furniture from Charles II to Queen Anne, page 57 to 59. 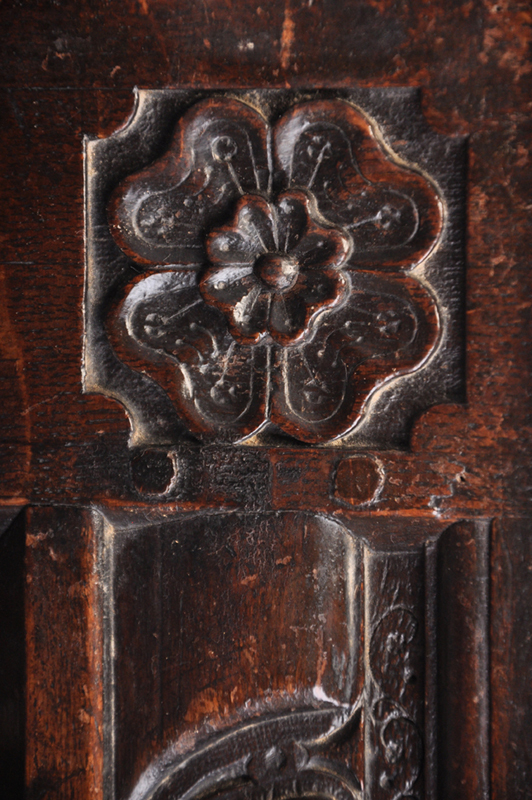 Herbert Cescinsly and Ernest R.Gribble, Early English Furniture and Woodwork, page 260 & 261. Dimensions 165cm high, 105cm wide, 48cm deep. 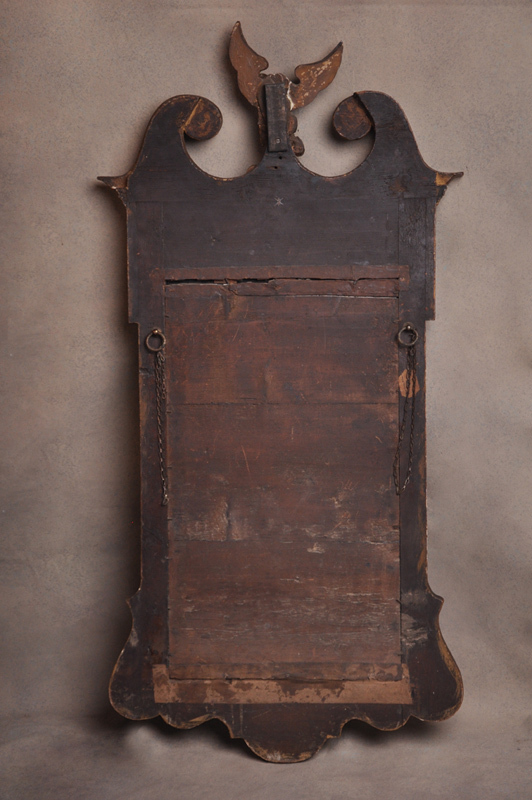 This is a wonderful example of an 18th Century Walnut french bread hanging cupboard or Panettiere. 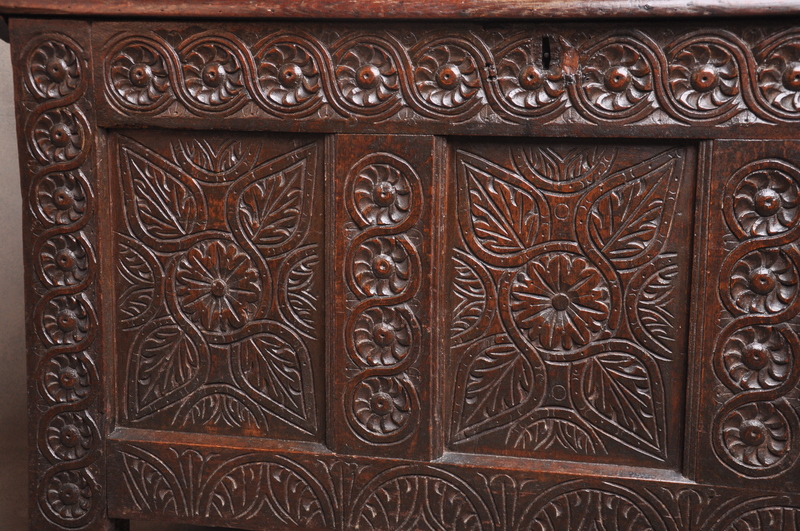 The colour is outstanding it is rich ,warm and really glows, the carving is crisply executed. 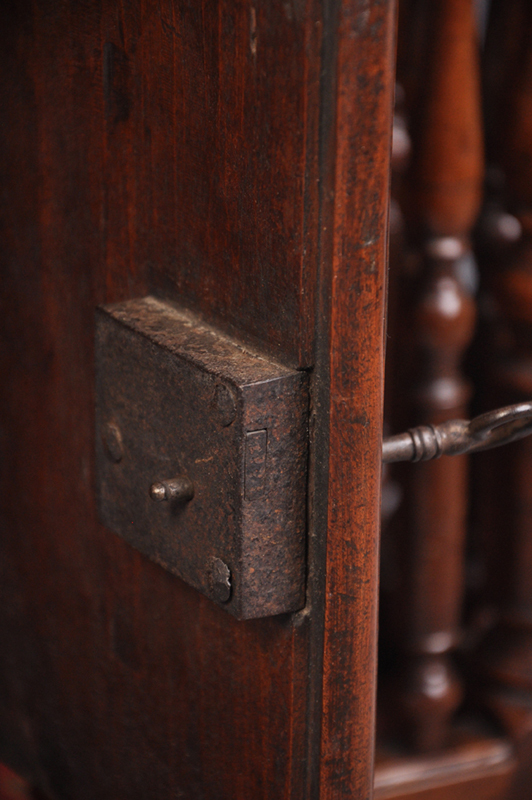 The escutcheon, hinge and lock are original, amazingly so is the key. 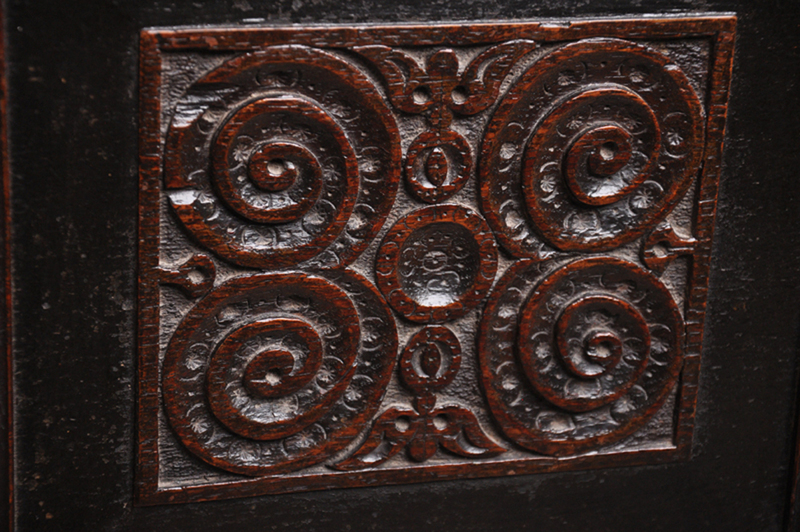 There are many 19th Century examples to be found but not many from the 18th Century. The word Panettiere translates simply as baker. Panettieres were usually crafted with fittings to allow them to be hung on the wall, keeping the bread safe from children and pets, until it could be served at the family table. The best and most original panettieres are those of Provence, which then influenced those of Languedoc and Dauphiné. 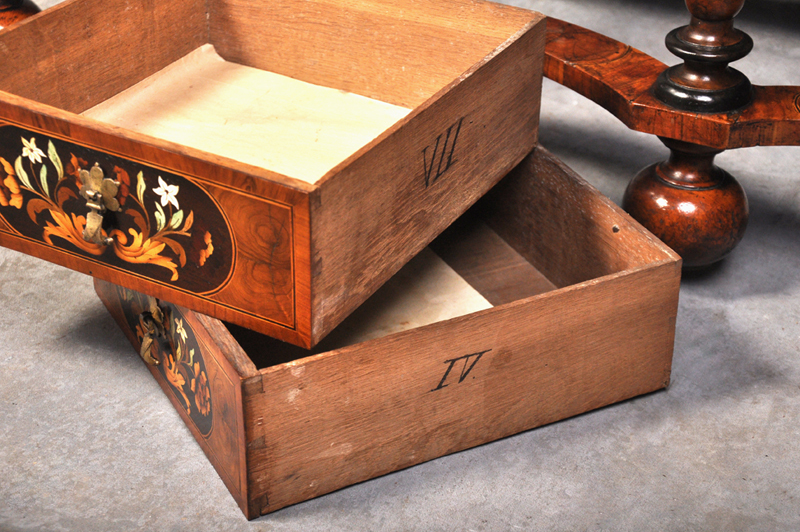 Originally the panetiere was simply a wooden box, perforated and placed directly on the table. 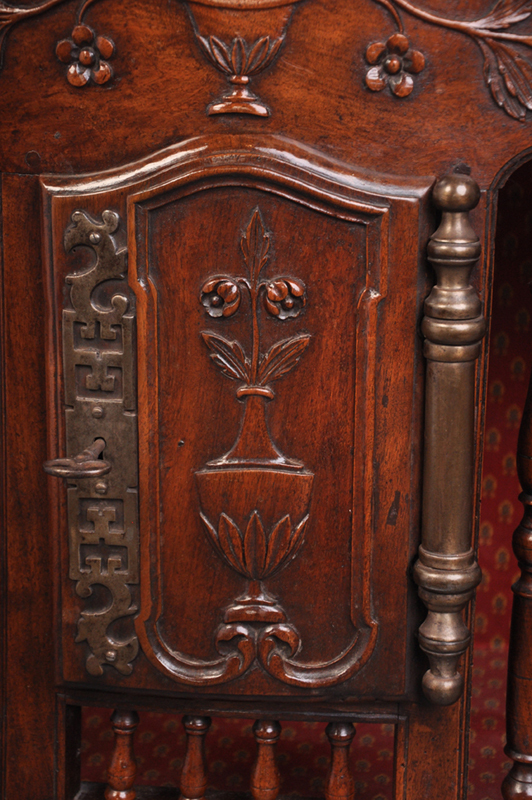 In the 18th century, turned wood spindles and more decorative aprons and cornices began to appear, replacing coarse wood panels. 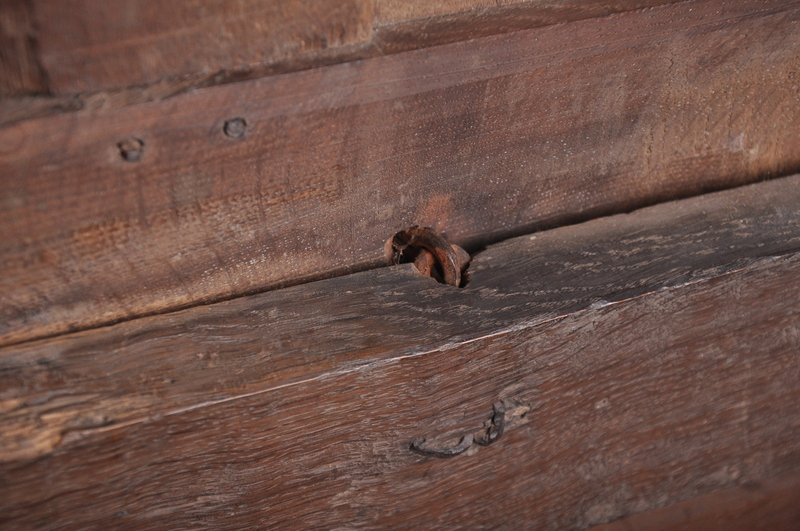 We also see at this time the addition of small doors through which the bread could be inserted, and locks to further secure the perishable treasure. 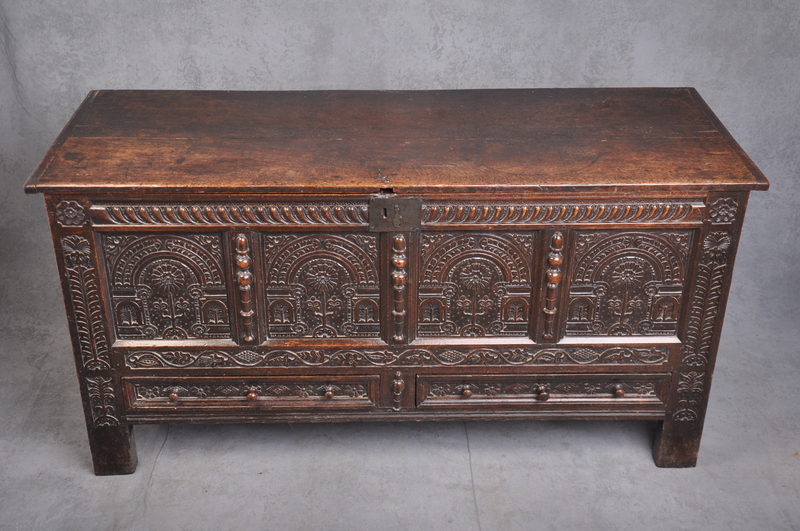 This is an exceptional 17th Century Oak Coffer or Mule Kist in really good original condition with a great colour and patina. 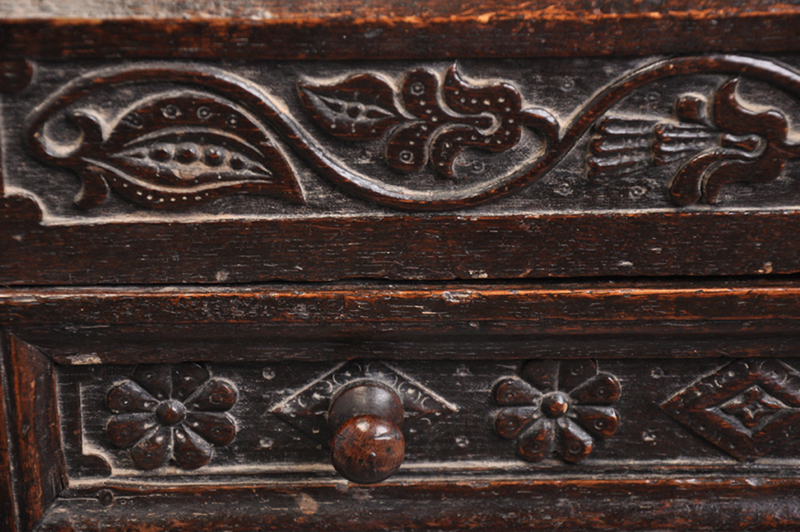 The quality of the carving and for that matter the whole construction of the chest is first class. 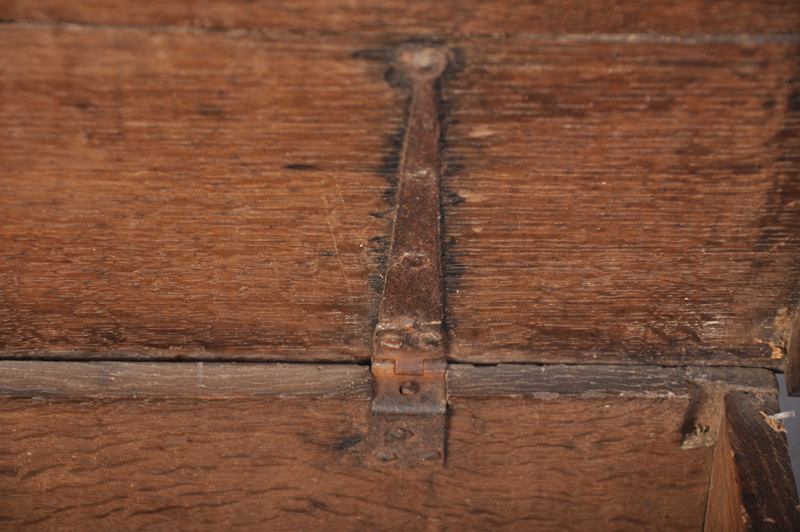 It retains wonderful quality original strap hinges.